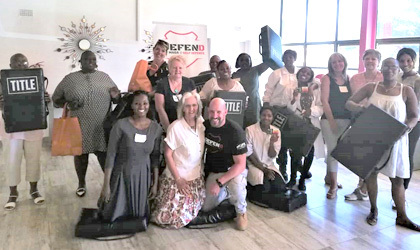 IDEFEND is the supremely effective and constantly evolving Israeli Self Defence system – known for its simplicity, ease of learning and devastating power. Krav Maga is used worldwide by men and women from all walks of life, as well as Special and other Military units and Law Enforcement agencies. IDEFEND which is based on Krav Maga is for you. What makes IDEFEND so different to other martial arts is that it is not a sport. The ultimate goal of IDEFEND is your survival against threats or attacks. It is a pure self defence system. The techniques we use are there to protect against incoming threats and attacks and to prevent the attacker from causing any further harm or physical injury to us. IDEFEND teaches Krav Maga which encompasses safe behaviour, awareness training, simple strategy, and of course, physical self defence. Our Krav Maga system is designed to enable a smaller defender to successfully neutralize a threat or attack from a larger attacker and is perfectly suited for anyone wanting to learn how to defend themselves. IDEFEND is for YOU, it is developed to be easily learned, easily remembered, easily applied and extremely effective. Come and have fun while learn how to defend yourself and your family. IDEFEND - Sandringham is excited to inform you that we have paired up with Discovery Vitality points machine which has been installed at our Sandringham facility. points machine at a registered fitness facility and earn Vitality points. Earn points while you train! © 2019 IDEFEND - This website is protected by copyright and trademark laws under R.S.A and International law.